John Flansburgh, the co-frontman for They Might Be Giants, once referred to his band as “the most stoppable force in rock music”. He was referring to TMBG’s early years as a duo – with co-conspirator John Linnell – and the fact that they had few music industry connections and little more than an abundance of creativity going for them. Now, more than 35 years since the pair started making music together, they’re hitting another creative peak, both on record and live. Pretty much the opposite of a stoppable force, if you ask me. In January this year they released I Like Fun, their 20th studio album – and it’s as good as anything in their lengthy discography. 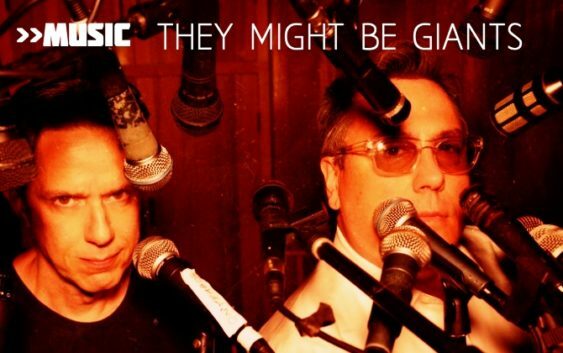 They’re also travelling the UK and visiting Edinburgh as part of their ‘An Evening With They Might Be Giants’ tour, which consists of two long sets as they delve through their extensive catalogue. There are no support acts, so fans are advised to get there early. If you haven’t yet got a ticket, be quick – at the time of writing there were only about 50 left for sale for the show at the Queen’s Hall on October 5. TMBG have added to their usual five-member touring outfit with trumpeter Curt Ramm, who has played with Bruce Springsteen (both the E Street Band and the Seeger Sessions band) and Nile Rodgers’ Chic, among many others. Despite the fact that they have already released one of their most acclaimed albums this year, TMBG continue to release a song every WEEK online in 2018. Their original Dial-A-Song service was literally a phone number with an answering machine, and now it’s a website for streaming and downloading (fans can get access to download every song for a one-off payment of US$30). In September they released ‘The Communists Have the Music’ on Dial-A-Song, an instant earworm piece of pop perfection that is sure to become one of their best-loved tunes. They have also released it as a single. Another recent Dial-A-Song highlight is an in-studio performance of wondrous new number, ‘Applause Applause Applause’ – clearly, there’s still no shortage of inspiration between Flansburgh and Linnell after all this time. “I think we’re just very lucky that we all get along so well,” Flansburgh says. “People look at the lifespan of bands – the way people talk about it, it sounds like they’re in a sensory deprivation tank, trapped together. Fortunately we have enough time apart [when not touring] that we’re not always in close quarters. That’s always the biggest character test of anybody, how to travel for months on end when you’re two feet away from somebody for the entire time. It would drive most married couples crazy to be this close. But it’s totally mellow.